The theory behind bot behaviour is easy peasy — give the AI a set of basic orders and responses, and let unit AI handle the rest. As the Pulse cannons are just Storm Bolt, a single-target damage/stun, the built-in unit AI should be quite happy to use it at any point. EMP Burst is just War Stomp, so that should be fine — the unit AI should cast it when surrounded as is appropriate (though I’ve noticed the game being reluctant to do that in the past so it might need a few minor nudges). Overdrive may be a little more problematic, because as far as the computer is concerned that’s Immolation — a mana-draining area-damage spell that surrounds you with flames, rather than a health-draining speed boost. And let’s just not think about undercarriage units for now. Of course another silly copy-pasta error meant that it took until 4:52pm for the AI to even get off their backsides and start moving around the arena. After that little hiccup, though, things start to work as we expect them to. 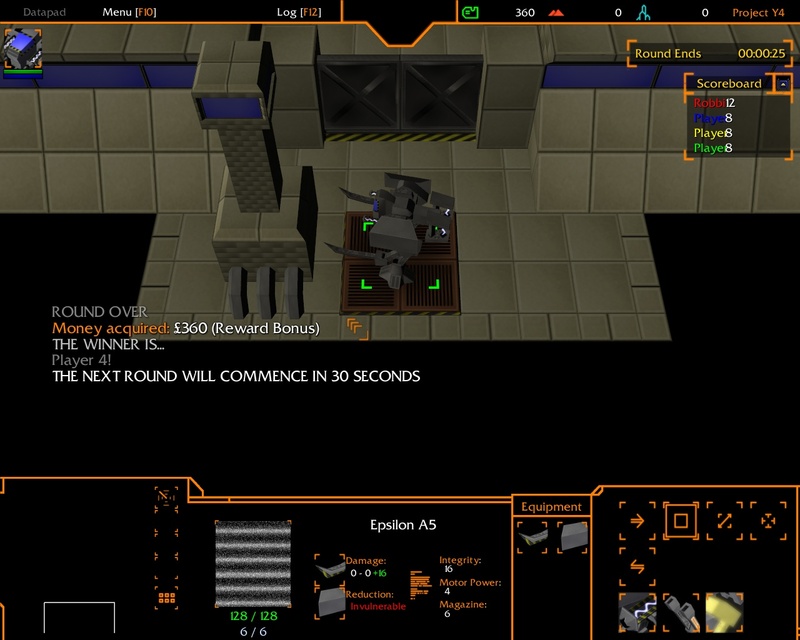 Apart from the death camera, which is still hard-set to Player 1 (Red) instead of PLAYER_Player[Custom Value of (Dying Unit)]. The death trigger uses a couple of Waits (huergh) so it’s a bizarre tangle of normal trigger actions with custom script lines jemmied in to use local variables. Small things, though, and overall it’s been a nice positive start the evening! By 5:14pm the AI are gleefully bashing the hell out of each other. 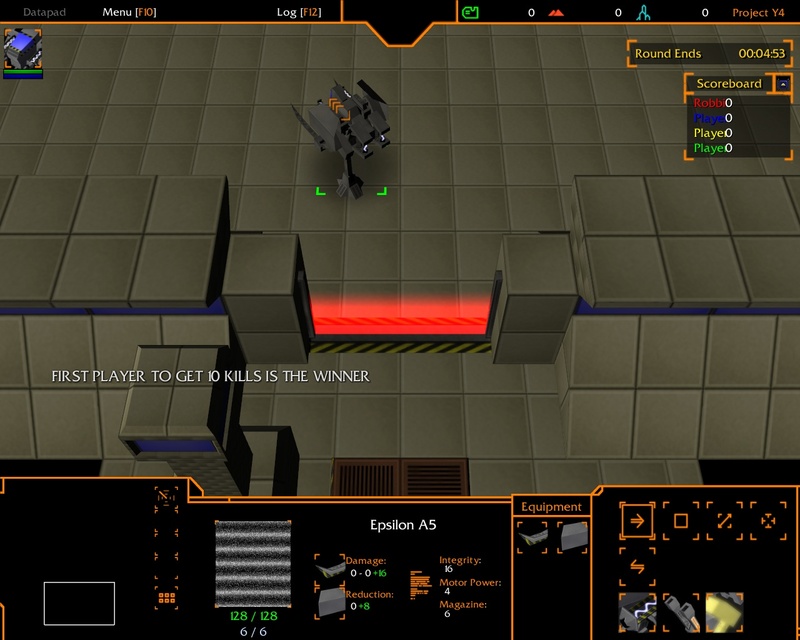 As hypothesised, the combination of a few choice event responses, an order loop and basic unit AI has resulted in a fairly natural concoction — the AI are programmed to, upon finding a target, enable Overdrive and have at them. If they’re attacked by a stronger opponent (i.e. if they’re engaging drones and get attacked by a hero), they’ll fire the Pulse Cannons and take them on instead. If they find themselves in a group, they’ll deploy EMP Burst. It’s glorious! What I need now is a multiboard to display scores… Oh, yeah, and I still need to lose at least 1.71MB. Happy days. At 5:39pm dinner is served and a short break is had. The AIs have a tendancy to wail on the wreckage of previous kills… Better do something about that. At 6:20pm Daedalus roars back into life to the sound of Gary Numan’s The Pleasure Principle and World Edit heaves its unsightly bulk back into RAM once more. It’s time to put some more framework around those pesky, meandering bots — we need items, we need upgrades, and we need them now! I don’t think that I’ll be giving players access to the full equipment roster of Project Y4 itself — there are far too many items, and some of them are surely crazy enough to totally destabilise the arena format. So it’ll be a selection of choice specimens to give a good feel for the real thing. And that’ll let me cut down some more megabytes, because after skirling through the sound effects I’m still 0.54MB over the maximum limit! 7:08pm comes and goes and there’s a new multiboard scoreboard display and item roster paring has begun. Away with the secret weapons and away with the imba weapons — let’s keep this professional. Yes, yes, I’ve dropped the Ammo Pack shields, but only because the Epsilon doesn’t have artillery cannons. Yeaah, cutting out all those items and all their left/right/item models and their BTNs and DISBTNs has started to take the filesize right down. Considering how few slots there are on the control panel, we’ll be all set in no time. Though I still need to do something with that skybox, I want to have Earth floating beneath it instead of made-up-moon Eris as in the Project Y4 introduction and that’s still going to eat up the kilobytes (though less than having the moon and Jupiter textures). At 7:36pm the map’s file size finally falls below 8MB as more and more weapons and shields get the chop. The project is saved, but bath time looms as the 8:00pm deadline approaches. Wouldn’t be a map of mine without a spurious glowing wall. So, the time is 8:00pm and that’s bath time and that means that this is very much The Day I Made An Arena Y4. Whew, that was a bit of a hair-raising ride. I have spent every waking hour since this morning blasting away at this project, barring the odd stops for meals, bodily functions and to change the CD. Is it finished? No, but it’s bloody close to it. Thursday and Friday it’s back to work but with the weekend on the horizon I don’t see why this can’t be “totally” finished by Sunday or Monday. Power-ups in the arena and tying items into the AI. Undercarriage units and tying them into the AI. Finish the terrain, make a new skybox, do miscelllaneous bits of artwork. Tidy up the multiboard, feedback messages and suchlike. Add wild animals and round variations. That’s an awfully small list. Sure, there are a few pipe-dream elements I don’t want to bring into the equation just yet, but you don’t need to know about those. Sitting at 7.83MB but there’s still a lot more to cut! Beaten by my own bots. Huzzah! 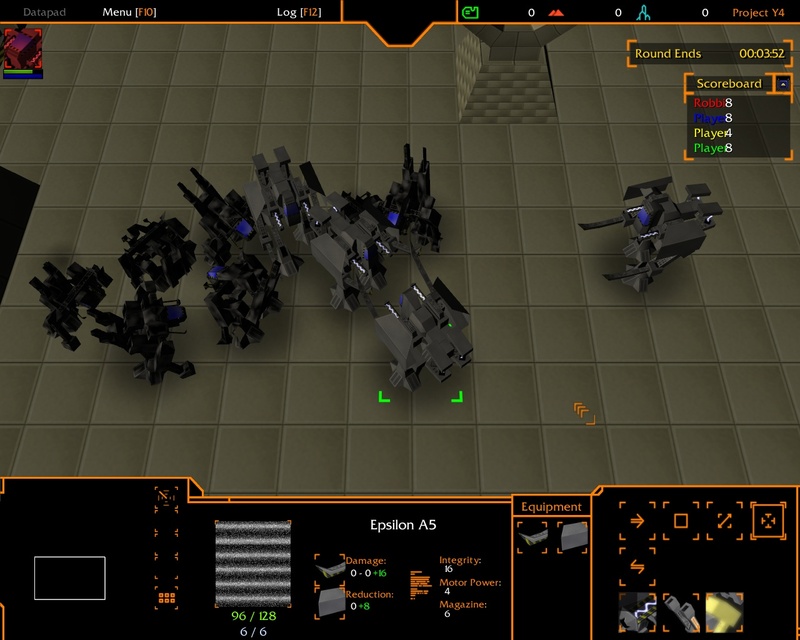 This entry was posted in Modding, Nondescript, Project Y4, Warcraft III and tagged arena, binge, map, project y4, rdz industries by Rao Dao Zao. Bookmark the permalink. Excellently-scripted adventure through your mind, RDZ. I must admit, I never thought actually slogging through the WE could be made interesting to outsiders. Oh wait, I’m not :P. Well anyway. Good luck! Not so much a trip through WE as a rollercoaster ride through my insanely haphazard working practices, and basically unedited too!